Reading and share top 10 famous quotes and sayings about Untruthful by famous authors and people. Browse top 10 famous quotes and sayings about Untruthful by most favorite authors. 1. 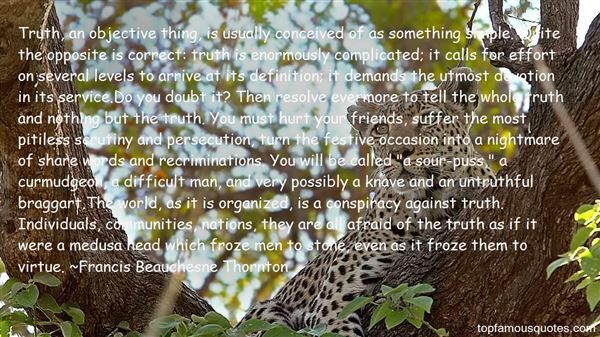 "Truth, an objective thing, is usually conceived of as something simple. Quite the opposite is correct: truth is enormously complicated; it calls for effort on several levels to arrive at its definition; it demands the utmost devotion in its service.Do you doubt it? Then resolve evermore to tell the whole truth and nothing but the truth. You must hurt your friends, suffer the most pitiless scrutiny and persecution, turn the festive occasion into a nightmare of share words and recriminations. You will be called "a sour-puss," a curmudgeon, a difficult man, and very possibly a knave and an untruthful braggart.The world, as it is organized, is a conspiracy against truth. Individuals, communities, nations, they are all afraid of the truth as if it were a medusa head which froze men to stone, even as it froze them to virtue." 2. "Do we throw off the false 'cloak' at a party, or do we merely put on an untruthful yellow dress?" 3. "Was my sin basically one of untruthfulness? Or, more likely, one of cowardice? But the liar knows the truth. The coward knows his fear and runs away." 4. 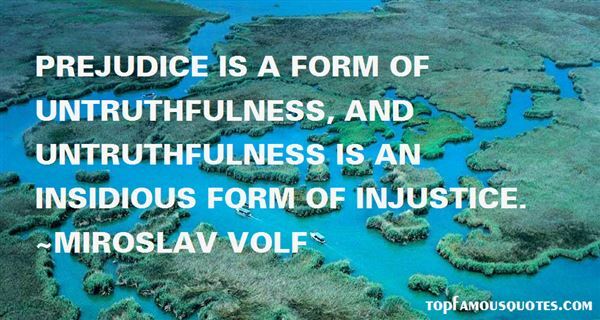 "Prejudice is a form of untruthfulness, and untruthfulness is an insidious form of injustice." 5. "Untruthful! My nephew Algernon? Impossible! He is an Oxonian." 6. "A witch didn't do things because they seemed a good idea at the time! That was practically cackling. You had to deal every day with people who were foolish and lazy and untruthful and downright unpleasant, and you could certainly end up thinking that the world would be considerably improved if you gave them a slap. But you didn't because, as Miss Tick had once explained:a) it would make the world a better place for only a very short time;b) it would then make the world a slightly worse place; andc) you're not supposed to be as stupid as they are." 7. "You had to deal every day with people who were foolish and lazy and untruthful and downright unpleasant, and you could certainly end up thinking that the world would be considerably improved if you gave them a slap." 8. "Imagination can't create anything new, can it? It only recycles bits and pieces from the world and reassembles them into visions... So when we thing we've escaped the unbearable ordinariness and, well, untruthfulness of our lives, it's really only the same old ordinariness and falseness rearranged into the appearance of novelty and truth. Nothing unknown is knowable. Don't you think it's depressing?" 9. "I am edgy, raw, offensive, vulgar, untruthful, but intelligent. My jokes are always realistic. I do not make fun of children or people who cannot fight back. That is my limitation." 10. "Children are people, and they should have to reach to learn about things, to understand things, just as adults have to reach if they want to grow in mental stature. Life is composed of lights and shadows, and we would be untruthful, insincere, and saccharine if we tried to pretend there were no shadows. Most things are good, and they are the strongest things; but there are evil things too, and you are not doing a child a favor by trying to shield him from reality. 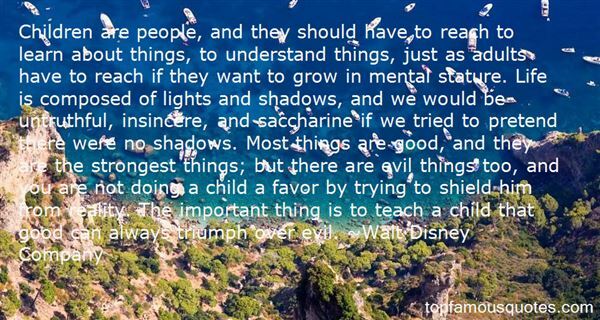 The important thing is to teach a child that good can always triumph over evil." Half of my employees are women."